Gulf Oil and Discover Financial Services launched a summer savings campaign geared to reward consumers for downloading the new Gulf Pay app and linking their Discover card as the preferred payment method. 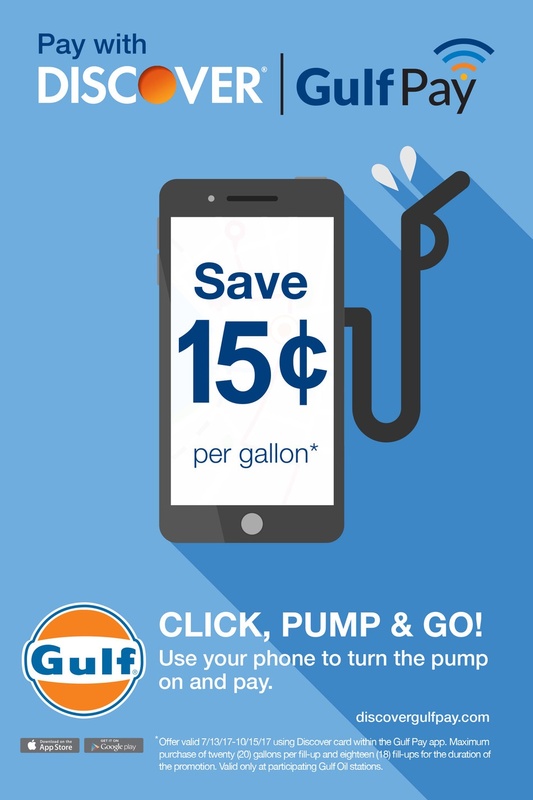 By downloading the free Gulf Pay app and linking a Discover card within the wallet, users will automatically start saving 15 cents off on each gallon of gasoline (up to 20 gallons per visit for a total of 18 visits) when utilizing their Discover card for payment at participating stations throughout New England and New York. The campaign will provide users with exclusive savings starting July 13th and running through October 15th. Gulf Pay, built on the PetroZone platform, offers a convenient and seamless shopping experience by allowing users to securely pay at the pump with their mobile phones while utilizing token encrypted data. Users can also use the app to locate the closest Gulf station, access live pricing and reliable directions, and view station offerings. "By teaming up with Discover this summer, we can provide increased security and exclusive savings to an already loyal and growing group of existing cardholders with Gulf Pay," Marg McDonnell, senior director of credit card operations at Gulf Oil said. "This campaign allows us to incentivize more motorists to choose Gulf and Discover and ultimately drives more traffic into our stations." The program will be supported by advertising from both Gulf and Discover. The support will come from promotional materials at participating stations, digital and radio advertisements in the New England market, and targeted email and social messaging. "Discover is always looking for new and innovative ways to give our card members the best possible experience," Andrew Hopkins, vice president of Portfolio Marketing at Discover said. "We want to encourage new and existing Discover card members to add their Discover card to Gulf Pay and take advantage of this generous offer." The Gulf Pay app launched in both the Apple App Store and Google Play stores in June and is currently accepted at participating Gulf retail fuel locations throughout select New England and New York markets. To learn more and start saving, visit www.discovergulfpay.com.